Click Old Mountain Press to visit our home page. Click Information Now to visit Sam's web site! He is a graduate of North Carolina State University, Raleigh, with a BA (78) and an MA (80) in English. He has taught English Composition and Literature at N.C. State, North Carolina Wesleyan (Rocky Mount, N.C.), and Fayetteville Technical Community College, where he is currently employed. 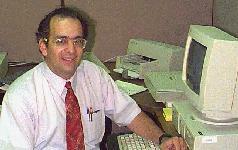 Since 1992, he has also run a writing/editing business, Information Now. His work includes ghost writing as well as editing poetry, fiction, and business/medical documents. Sam's editing fees are based on a 250-word page. For example, if your book is about 50,000 words, then that is approximately 200 pages. He charges anywhere from 75 cents per page (for light proofreading) all the way up to $5+ per page (for heavy-editing/ghostwriting). If you send Sam a 1,000 word sample of your work via e-mail (either as an attached file or within the body of an e-mail message) or via US Mail (double-spaced, 1" margins), he'll give you a sample of his editing, along with an estimate for editing your entire work. The charge for this sample editing is $50. If you agree to his proposed estimate, he asks that you send 1/2 payment before he begins editing the entire work; the other half payment is due when he returns half the completed work to you. Then he'll send you the rest. He prefers to work on a hard copy, so when you send 1/2 payment for him to begin, send him the manuscript, on white paper with 1 inch margins, typed in a standard font (such as Times New Roman). Begin by getting an estimate and sample editing of your work.